My family loves to be outside and do things together. We also love to go on bike rides. For the past 2 years we have gone on a bike ride every Saturday morning together (weather permitting). Last year when our youngest was 8, we had a surprise baby. She is such a joy, but has changed things quite a bit in our home. When she was a newborn my husband had to take the kids on their weekly rides without me. Now that our little girl is 1, we have tried to go on bike rides together as a family again but our baby makes things so hard. We have tried a bike trailer and she can't stand it. She screams the entire time. We don't want to leave her home while we take the older kids. Long story, but my question is this, Do you have any suggestions of how we can "carry" our little girl so she is happy and we can continue to do things together as a family? New babies change things especially when your other children are a little older and you have established routines and traditions. I am so glad that you and your family are trying to do things together. Don't give up, what ever you do. One of the best ways to strengthen families is to participate in wholesome activities together. And not just activities, but outside activities show huge benefits for families. You don't want to leave anyone at home. I have two suggestions. From research and personal experience. 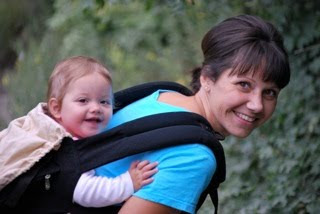 For your walks and hikes, you can't go wrong with the ERGObaby Carrier. It is by far my favorite, and from what I have read and researched I am not the only one. "ERGO carriers are a hands free system with an all in one baby carrier that can be used in the front, back, and hip position, infant to toddler"
We found the ERGO with our third child. I wish I had found it sooner. We had tried all the other carriers. Bjorn, everything. They hurt my back, or our babies grew out of them too soon, or I didn't feel like they supported the baby good enough. The first time I wore the ERGO I was in heaven. NO pain for me or the baby. And, my favorite part is that there is a newborn insert so you can put new little babies in there. Take it out and your two year old will be happy as can be. They also have a great feature, a hood that you can snap on when your baby has fallen asleep so that their heads aren't bobbing all over the place. I can't say enough about his carrier. I have worn it in every position, and we have not only walked with it, but taken 2-3 hour hikes while wearing our youngest in the carrier. The only downside, it is not cheap. $110.00, but worth every penny. We have used ours so much that it quickly paid for itself. Also keep in mind that you can't wear kids forward facing on your front. I worried about this at first, but it hasn't mattered. When our baby was little I wanted her to face me and be close. When she was ready to look around more I moved her to my hip, and now she rides on my back. 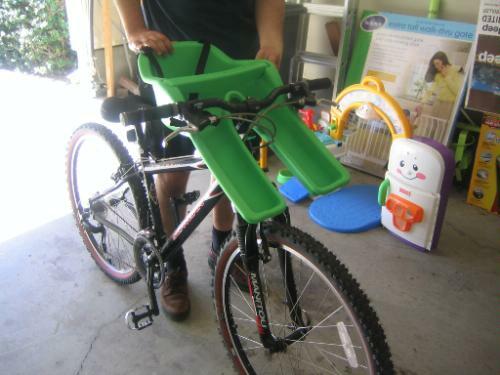 This will make your family walks and outings much more pleasant. No more screaming. ERGO in action. My mom wearing it on the beach in La Jolla. Me wearing our daughter on a hike above Sundance in Utah. Now for the bike ride that you haven't been able to take lately. Our favorite way to ride bikes is with the ibert. Our daughter couldn't stand bike trailers either. She would scream any time we tried to use one. We found something so much better and easier to use. 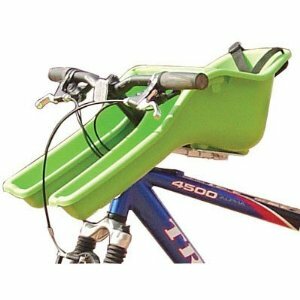 Unlike the old bike mounts, the ibert mounts on the front of the bike, not the back, and it does not make it hard for the grown up to ride. It is safe, supported, and the kids can see everything. Plus, it is so much easier than pulling a trailer. We got our ibert on Amazon. Great price, great product. This should take care of your screaming problems. Fresh air in your daughters face and the ability to see everything that is going on, she will love it. Our daughter feels like she is big just like her brother and sister. She sits and eats pretzels and laughs for miles as we go on bike rides together as a family. Pictures from Amazon. Sorry, I didn't have any of our own. How do you "carry" your little ones? Oooh, I really want an ergo, but it's a wee-bit expensive. I carry my daughter around in a ring sling and love it. 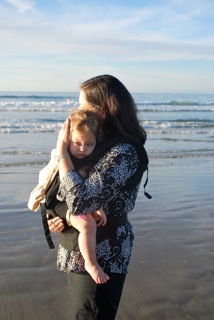 I really want a carrier that allows me to carry her on my back! Cute pics!